As July becomes the hottest month of the year a lot of the big fish have disappeared leaving the smaller fish the dominant catch of the summer. This past week I've taken the time to explore some new water and while my results were pretty disappointing, its always nice to have an adventure. I've been fish Red Bridge with great success. I know almost every hole that produces the biggest fish in the creek and with that knowledge I decided to look elsewhere for big fish. 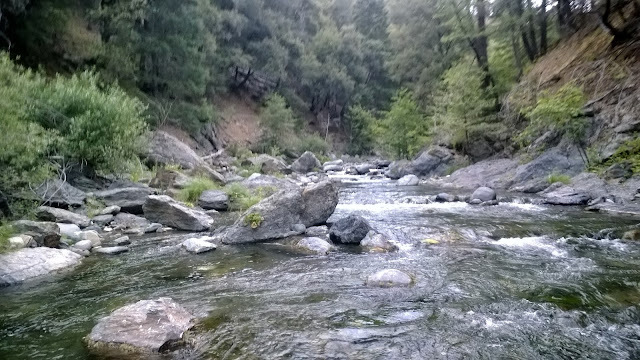 I drove out to K Road and waded upstream close to Lower Deer Creek Falls. Although there were some really nice holes I didn't catch anything too exciting. 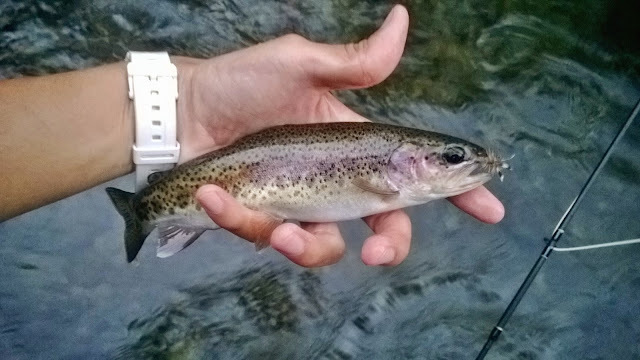 Most of the fish were around 5'' by far some of the smallest fish I've caught on the creek. I left around 7:00pm and fished above Red Bridge and got into some bigger fish. A few days later I decided to fish above Potato Patch Campground and near Upper Deer Creek Falls. 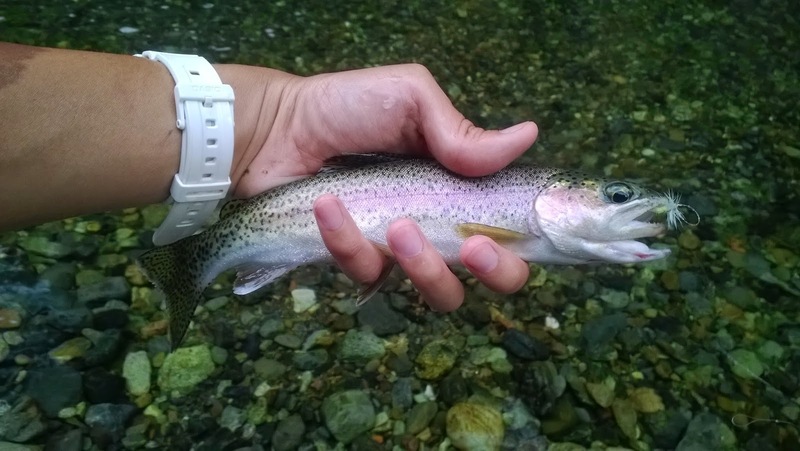 I hooked into a few trout that ripped some line out probably around 14'' but I didn't land any. Due the to drought perhaps the water is slightly colder upstream and the trout have migrated up? I saw a few salmon in the deeper holes which is a good sign despite the drought. Manda and I went up HWY 70 to fish and look for blackberries. We stopped around Storrie to fish the boulders. I tight-lined a stonefly and mayfly nymph for a bit but after checking the water temperature at around 70 - 73 degrees I decided to look elsewhere for fish. We drove further up towards Belden and I fished Yellow Creek. 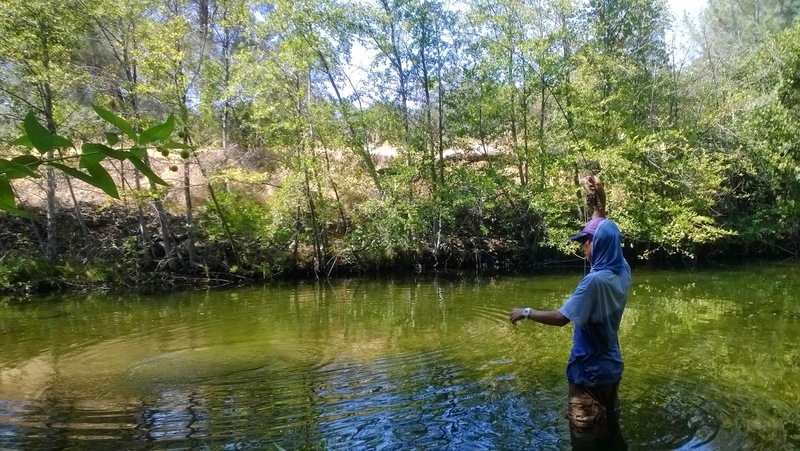 There is something special about fishing the streams in the Plumas National Forest, it's quite magical and I don't really know why or how to explain it. The scenery is just amazing. The creek was easy to access and the water was colder so after covering some water I got into a few fish that were your typical creek sized trout. I was hoping to catch some bigger fish that swam up the creek from the North Fork due to the warmer water but I didn't have much luck. The smallie fishing is still good. There have been schools of big pike minnow that I haven't been able to get into, but the smallies are still plentiful and aggressive. I saw a few big ones that were hiding in the shade but I couldn't get them to take. Still lots of fun. I'm kind of fed up with summer. I'll probably just take it easy until late summer early fall for the fishing to pick back up again. Weather is too damn hot.